Baba Rampal Verdict highlights: A Hisar court today found self-styled godman Sant Rampal guilty in two murder cases. The quantum of punishment will be announced on October 16 and 17. Baba Rampal Case Verdict highlights: Sant Rampal is currently lodged at Hisar’s Central Jail-2. Baba Rampal Case Verdict highlights: Self-styled godman Sant Rampal was convicted by a Hisar court in two murder cases on Thursday. The quantum of punishment will be announced on October 16 and 17. Rampal, who enjoys a huge fan following, is currently lodged at Hisar’s Central Jail-2. He was arrested in November 2015 after a two-week long stand-off between his followers and police which had left six dead and several others injured. A special court was set up inside the jail — Hisar’s Central Jail-1 — to pronounce the judgment via video conference. In the wake of the verdict, nearly 1,800 policemen were deployed to maintain law and order. To prevent a repeat of the events in Panchkula in August 2017 after the conviction of Dera Sacha Sauda chief Gurmeet Ram Rahim Singh, the police are checking every vehicle entering to the town fearing that Rampal’s followers might try to get into Hisar. The police have installed as many as 48 check posts in the town to prevent entry of anti-social elements apart from imposing prohibitory orders under Section 144 of the CrPC. Baba Rampal Case Verdict highlights: A Hisar court found Sant Rampal guilty in three murder cases today. Get latest updates here. It's an injustice to us. We will challenge the verdict before the high court, says Chand Rathee, media in-charge, Satlok Ashram. The court found 29 persons, including Rampal, guilty in the case. The accused were convicted under sections 302, 120(b) and 343 of the Indian Penal Code. In 2014, the Punjab and Haryana High Court had ordered the police to arrest Rampal after he failed to appear before the court. When police moved to arrest him, they found that thousands of his followers were inside the Satlok Ashram spread over 12-acres of land near Barwala town of Hisar district. When the followers barricaded themselves inside the ashram, the authorities were forced to cut off power and water supply to force them out. Later, police and Rampal’s followers clashed as security personnel tried to move into the ashram. 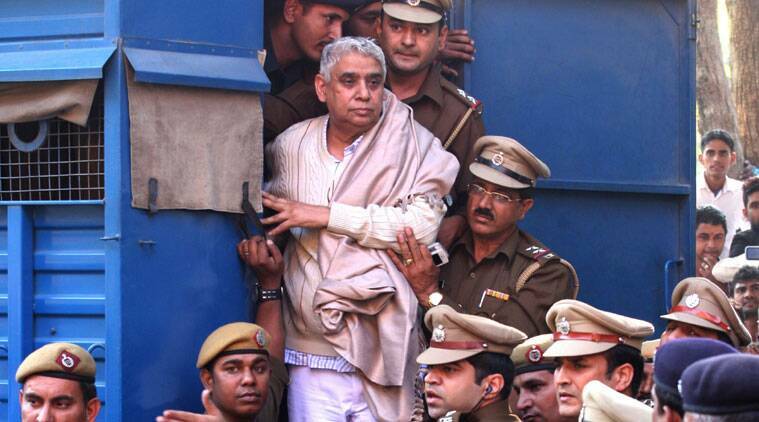 Finally, Rampal was arrested on November 19, 2014 and his 20,000 followers were evacuated from the ashram. Five women and a child had died in the tense standoff. Then, it was believed that they died because of suffocation inside the dera. Rampal was blamed for these deaths and was booked under murder charges. Satlok Ashram media in-charge, Chand Rathee, told earlier The Indian Express that police had lodged as many as six FIRs against Rampal and his supporters. “The court has already acquited Sant Rampal in two cases which include charges of taking followers hostage. In another two cases registered in connection with the six deaths, the court would pronounce its verdict today. Two other cases, including one lodged under the charges of sedition, are still pending in the court,” said Rathee. As per latest reports, Rampal has been convicted in both the murder cases; the quantum of sentence will be pronounced on October 16 and 17. In 1999, Rampal-led Bandi Chhor Mukti Trust had built an ashram in Karontha village of Rohtak district which later became a cause of controversy between his followers and the Arya Samaj. He courted a major controversy in 2006 after a bloody battle between his followers and Arya Samajis in which one person was killed while 59 others were seriously injured near the ashram. Rampal lived in Karontha ashram till 2006 when the district administration attached those properties. He then moved to the Barwala (Hisar) ashram and stayed there till his arrest. The ashram was closed after the November 2014 clashes. Sources said that currently, two ashrams of his sect are operational in Bhiwani and Delhi. Founder of Satlok Ashram, touted as a socio-cultural movement in Haryana, 63-year-old Rampal is the head of a religious sect called Kabir Panth. Born Rampal Singh Jatin in Dhanana village in Sonepat district, Sant Rampal was popularly referred to by his followers as ‘Jagatguru Rampal Ji’. Rampal had obtained his diploma from Nilokheri’s Industrial Training Institute, after which he worked as a junior engineer in the Haryana Government’s irrigation department. He quit his job in 1996. Rampal was supposedly a devout follower of the Hindu deities such as Lord Krishna, Hanuman. But after he met Swami Ramdevanand, he apparently abandoned Hinduism. Soon after, he went on to become a self-styled godman claiming to be the successor of Kabir, whom he believes to the supreme God. Some of his followers reportedly consider him as the reincarnation of Kabir. The Satlok Ashram was founded in 1991 in Karotha village of Rohtak district. By 2000s, he established several other ashrams as well as lapped up several followers in Haryana, notably from Jhajjar and Rohtak districts. He is married with two sons and two daughters. Click for more information. Haryana District Collector Ashok Kumar Meena told news agency ANI, "Ahead of the verdict, we have taken adequate measures to maintain law and order. Section 144 has been imposed across Hisar district. Around 2,000 police personnel have been deployed." While the self-styled godman is lodged in Hisar Central Jail 2, the special court is being held in Hisar Central Jail 1. There is a distance of four kilometres between the two prisons. Rampal will either be produced before the court or appear via video-conferencing for the hearing. Additional District and Sessions Judge DR Chalia will shortly pronounce the verdict in the two murder cases against the self-styled godman. The prosecution lawyers have arrived at the court. Ahead of the court verdict in two murder cases against self-styled godman Sant Rampal, the Haryana Police have fortified Hisar with the deployment of 1,800 policemen and checking of every vehicle entering the town. Rampal, who is currently lodged at Hisar’s Central Jail-2, was arrested in November 2014 after a two-week long stand-off between his followers and the police which had left six dead and several others injured. Hisar SP Shiv Charan Attri said that a special court will be held inside the jail — Hisar’s Central Jail-1 — to pronounce the judgment via video conference today. Stay tuned to our live blog for all latest updates. In 2014, the Punjab and Haryana High Court had ordered the police to arrest Rampal after he failed to appear before the court. When police moved to arrest him, they found that thousands of his followers were inside the Satlok Ashram spread over 12-acres of land near Barwala town of Hisar district. When the followers barricaded themselves inside the ashram, the authorities were forced to cut off power and water supply to force them out. Later, police and Rampal’s followers clashed as security personnel tried to move into the ashram. Finally, Rampal was arrested on November 19, 2014 and his 20,000 followers were evacuated from the ashram. Five women and a child had died in the tense standoff. Then, it was believed that they died because of suffocation inside the dera. Rampal was blamed for these deaths and was booked under murder charges.